Journal your way to self-care and share the good vibes with inspired keepsakes. Whether you set resolutions or intentions, 2018 is the year to center yourself and focus on self-care. A brand new journal is the perfect place for a fresh start: blank pages allow you to create your own wish lists and bring your dreams to life. Guided journals give you an extra push in the right direction, and whether you choose to focus on gratitude, mindfulness, acceptance, kindness, or joy, we’ve got just the thing for you. Reflection is a powerful tool, and by injecting a little bit of self-awareness into your daily life, 2018 will be your best year yet! Even though 2017 is safely behind you, take it upon yourself to make sure that 2018 you is the best you. Whether you’re an early bird or a night owl, set aside a few moments for yourself each day to set clear goals and center yourself, be mindful and express gratitude, and practice some much needed self-care. This guided journal is chock-full of activities, inspiring quotes, and writing prompts that will push you to be more present and aware of yourself, others, and your surroundings. Hot on the heels of the hit blockbuster movie Wonder, kids are learning that being understanding, accepting, and kind is what makes the world a better place. Whether or not they’re already fans of R.J. Palacio’s New York Times bestselling Wonder, this prompted journal is a great tool for kids ages 8 to 12 to practice self-reflection, learn to look beneath the surface, and know when to stand up for what’s right and kind. Self-care isn’t a solitary journey. 2018 is your moment to reflect on your life, weed out all the toxic people and experiences, and celebrate everyone and everything that has made you the person you love to be. These blank note cards, filled with inspirational quotes and Meera Lee Patel’s vibrant illustrations, are the perfect token to send to anyone you want to thank, encourage, or support through a life struggle. Yes, that even applies to yourself! Take charge of the new year with this interactive workbook that will help you decide how to build your career and your life into one that’s productive, creative, fulfilling, joyful, and full of great surprises. Reflect on where you are, set clear goals for where you want to go, and step outside your comfort zones with this motivational activity book. You can even use it as a self-care and personal growth time capsule: looking back is the best way to measure how far you’ve come—as long as you keep your head up, your mind clear, and your feet moving forward. If you’ve been inspired by the magic of Marie Kondo, get ready to incorporate her life-changing principles into your world with the help of this journal. Not only will Life-Changing Magic: A Journal encourage you to focus on what truly brings you joy, but it’s filled with motivating quotes from Kondo’s books to keep you uplifted and centered as you walk through the year with your head held high. New year, new journal, right? From the design mavericks at House Industries, this deluxe, clothbound journal is a stationery geek’s dream. With a gridded interior and smooth, sturdy writing paper (perfect for bullet-journaling), House Industries has created a well-designed keepsake for your 2018. With its soft, flexible cover, muted color palette, and grounding writing prompts, Mindfulness: A Journal is like a kiss on the cheek from your Best Self. Use this journal as a way to notice the little things in life. Once you master the art of noticing, appreciation and joy aren’t far behind. Bring some mindful intention to your daily life this year, and watch yourself blossom. We might be a few weeks into 2018, but it’s never too late to start a new tradition for yourself. Gretchen Rubin’s The Happiness Project One-Sentence Journal is anchored in self-care, and a commitment to this little blue book is all it takes to boost your happiness. A sentence a day may seem like a simple task, but when looked at over the course of five years, this journal will become a testament to your personal growth, change, and happiness. 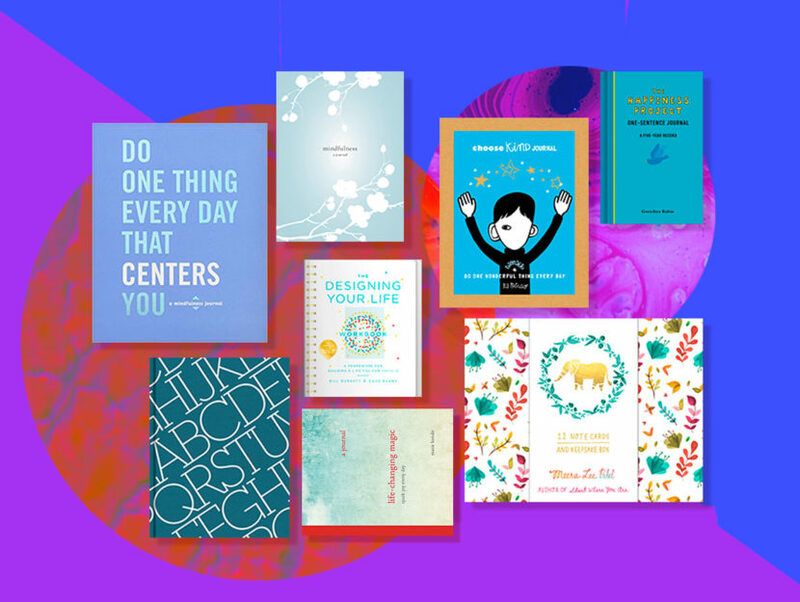 POTTER GIFT, an imprint of the Crown Publishing Group, is a lifestyle imprint specializing in design, fashion, humor, health, stationery, and other paper products.